In a diesel or compression ignition engine, the first and major difference compared to a spark ignition engine is the way that fuel and air is prepared for combustion, also, the way combustion is initiated. Diesel engines induce air only during the intake stroke - the air charge is compressed in the cylinder, heating it accordingly, the final temperature at the end of the compression stroke is above the self ignition temperature of the fuel and this factor is essential, as this initiates the combustion event when the fuel meets with the hot air. The advantage of compressing air only is that we don't have to consider self ignition of any fuel/air during compression (as per gasoline engine) as at this point in the engine cycle, there is no fuel to burn! The combustion process is quite different to the gasoline engine, the timing and rate of combustion is controlled via the introduction of fuel into the cylinder (via the fuel injection system). The combustion process itself takes place at the interface between the fuel and air. 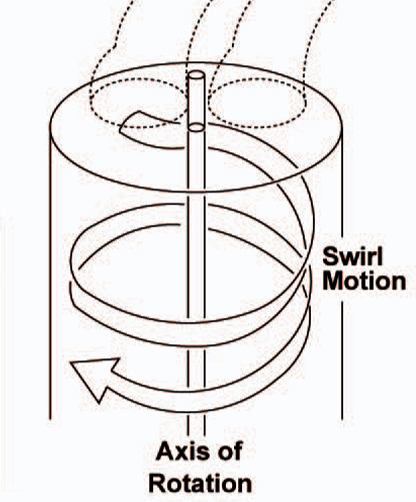 Therefore, sufficient air motion in the cylinder (generally swirl in a diesel engine) is essential to sweep away the products of combustion, ensuring that the fuel charge always has sufficient oxygen at the flame interface to prevent to formation of soot due to localised oxygen starvation. The overall volume of the combustion chamber itself has a variable air/fuel ratio during operation, that is only chemically correct at the fuel to air interface. In most operating conditions, the average air/fuel ratio in the cylinder is considerably weak (compared to stoichiometric). The engine power output is controlled by the amount of fuel injected, so no throttling is needed and this improves efficiency at part load due to the lack of pumping losses associated with restricting the airflow into the engine. The technical term associated with diesel type combustion is ‘diffusion’ combustion, as the fuel burning takes place at the interface where fuel diffuses into the air, and vice-versa. Due to the fact that fuel and air have to be mixed during the compression/expansion cycle (as opposed to pre-mixed, outside the cylinder) this reduces the amount of time available to complete the whole mixing and combustion process. Hence, generally speaking, diesel engines cannot rev as highly as gasoline engine. Therefore, to get more power from a diesel engine you increase the torque by turbocharging it! - common practice these days. It’s notable though that the diesel engine combustion cycle, and engine itself, is more efficient than gasoline for several reasons - the higher compression ratio increases the cycle efficiency, the lack of a throttle reduces pumping losses and the high precision, metered injection system reduces cylinder-to-cylinder variation. Diesel engines have undergone considerable development over the last few years, mainly in the area of fuel injection system technology. These developments have enabled sophisticated, electronically controlled injection systems, that can help reduce particulate emissions as well a engine noise emissions. I think that anybody would agree that travelling in a modern diesel engine car is no longer a noisy or unpleasant experience. Modern diesels are very refined and smooth in operation! Fig 3 - Direct and Indirect fuel injection - direct injection is predominant now! All modern diesel engines for passenger cars use direct injection technology (as opposed to indirect). In the past, indirect injection - injecting fuel into a pre-chamber - was technology used to create the required air charge motion to speed up the combustion event, thus increasing the maximum possible engine speed and power density. 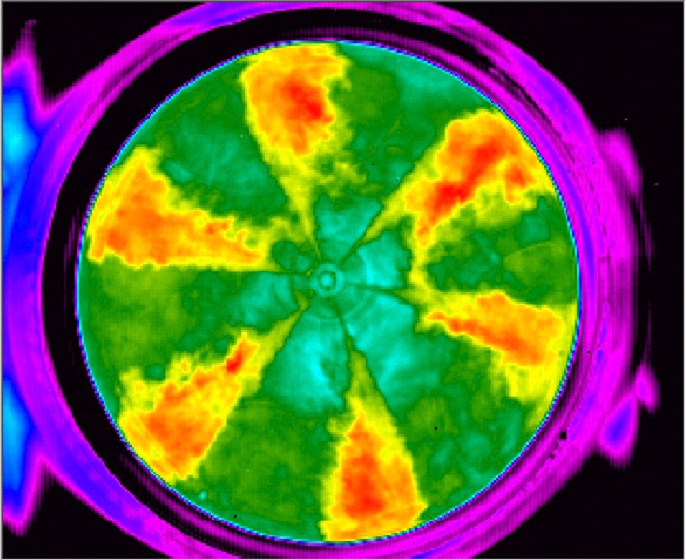 However, the increased surface area of the combustion and pre-chamber increases heat losses and reduces efficiency and has now been completely superseded by direct injection systems for most applications. In a modern diesel engine, the fuel injector nozzle sprays a complex, engineered spray pattern into the hot , highly turbulent combustion chamber gases, to initiate the combustion event at around TDC. The fuel is injected radially into the combustion chamber, the liquid fuel vaporises and mixes with the air as it travels away from the injector tip nozzles. The fuel self-ignites at multiple ignition sites along each of the injection sprays. The design of the combustion chamber, in the piston bowl, is critical to the efficiency of the combustion event. 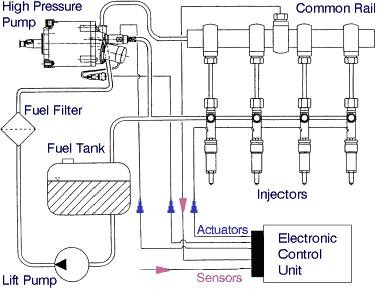 This design creates the necessary motion and energy in the cylinder charge to make sure that each tiny droplet of fuel has sufficient oxygen for complete combustion, right throughout the injection period. The initial combustion takes a certain time period to establish, known as the delay time, then the fuel will auto-ignite creating a very rapid energy release and the flame spreads rapidly through the fuel that is exposed to sufficient air for combustion. This creates a rapid rise in cylinder pressure, forcing the piston down the cylinder. 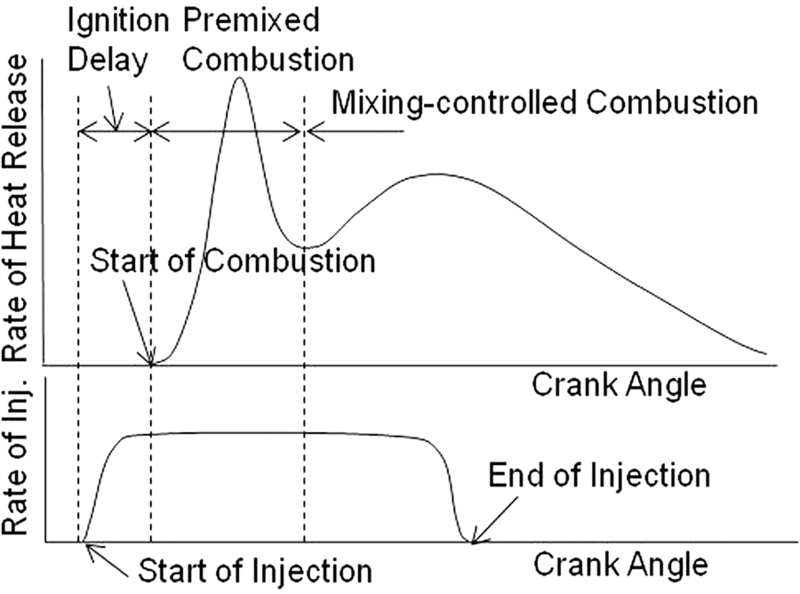 As the power (or expansion) stroke continues, further mixing of fuel and air occurs, accompanied by further, more controlled combustion period where energy release is controlled by injection rate. Note that it is the rapid release of energy, after the delay period, which causes the characteristic combustion ‘knock’ associated with diesel engine. The engine power is controlled via the quantity of fuel injected in each engine cycle.